There are trailers for virtually any purpose under the sun. Dump trailers are very versatile trailers that can be used at job sites and construction sites, and can even be used for both farming and industrial purposes. Dump trailers give you the convenience and usefulness of a dump truck, without all of the expenses and bulk. However, before you begin your search for the perfect dump trailer there are a few things you’ll need to keep in mind. Below we highlight what you need to know before you decide to invest in a dump trailer. Dump trailers can either be hooked up to a pickup truck, or another vehicle with the proper towing capacity. When you’re ready to dispose of debris or drop off material the bed of the trailer lifts up, allowing the material to slide out. The trailer is powered by a hydraulic pump. This pump can either be activated manually, or via an external remote, depending upon the style of dump trailer you purchase. Dump trailers are also more useful than larger dump trucks, because you can simply unhinge the trailer and leave it at the job site, or in storage, whenever it isn’t needed. When you’re searching for the perfect dump trailer you’ll have a lot to consider. There are a lot of different variations of dump trailers. So, you’ll want to take stock of what you’ll be using it for, now and into the future, before you buy. If you’re going to be loading heavy material, then you’ll need a dump trailer that can withstand any bumps and bruises. Look for a heavy gauge material that can withstand anything you throw in it. You’d hate for your trailer to bend or buckle, because it can’t handle the load. The size of dump trailer you require will depend upon what you’re hauling. Will you be carrying construction material, like steel beams, wood, and concrete? Will you be hauling landscape material like mulch, branches, and glass clippings? Or, will you be hauling something else entirely? Usually, the side of the trailer can be adjusted to accommodate larger loads. You’ll have a choice between small dump trailers and large dump trailers. 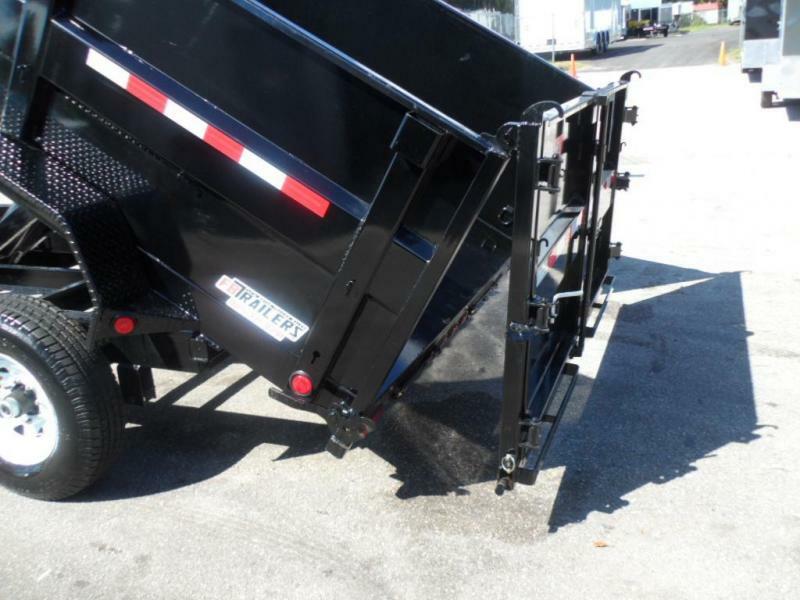 Small dump trailers usually have a single axel and range from 4x8 feet to 5x8 feet. While large dump trailers usually have two axels can go up to 8x20 feet. Since you’ll probably have a lot of heavy material that you need to transport you’ll probably need ramps to help you load the trailer. Some dump trailers have ramps included, while others you’ll have to add them at an additional cost. Most dump trailers will have gates that allow you to secure the back of the trailer when in motion. There are various styles, but the most common are single and double hinge. You’ll have various axel styles when choosing a dump trailer. First you have straight axel dump trailers, which will keep your trailer bed around 30 inches off the ground. This will help to provide you with extra clearance. Second you have drop axel dump trailers that tend to rest lower and have a ground clearance of around 20 to 27 inches. This can be more useful for loading large wheeled equipment. Before you purchase a dump trailer you’ll want to consider your needs and the reasons you’ll be using the trailer. This will help you choose the right dump trailer you can use over the long-term. We hope the tips above will help you in your selection. If you’re in the market for a new or used dump trailer, then we hope you consider FB Trailers.